But when a social worker reached out to Derrick Freeman, indicating the boy in need of help might be his biological son, David’s life took a rare and momentous upward turn. After a DNA test confirmed his paternity, Freeman fought for custody and immediately sought out help for his newfound son in every corner. He worked with David’s school counselor and tirelessly home-schooled the boy until they could find a stable learning environment that would be the right fit to accommodate his special needs and therapy services. That right fit turned out to be Villa Esperanza Services, a unique Pasadena-based service provider for intellectually and developmentally disabled individuals. Now, in less than one year at the school, David has grown into a happy, healthy and outgoing boy. Before Villa, he’d never had a friend before, he told his dad. 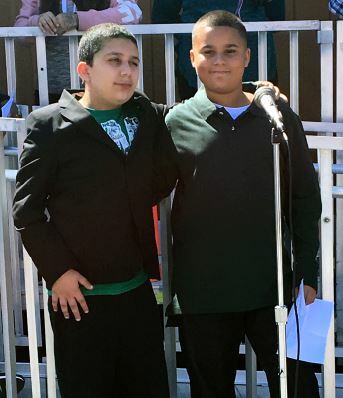 David Ledden (right), a student at Villa Esperanza School, gives a speech at a recent spirit day rally with support from his friend, Sarkees. David’s story might not be the typical one at Villa Esperanza Services, but then again, no story is at the nonprofit organization, whose mission since 1961 has been to meet the special needs of each individual and provide love and hope within a continuum of care that ranges from infancy to adulthood. Villa Esperanza Services first began as an independent day school in Pasadena for children with Down syndrome, back in a day when no public schools offered programs for children with developmental disabilities. Building on the vision of a small group of mothers, who believed their special-needs children deserved quality care and education, Villa has become a place for individuals with developmental disabilities to thrive, no longer secluded but visible members of the community, where they work, attend school and live independently. Responding to the enormous need of an oft-overlooked population, the nonprofit has been at the forefront of creating programs to give the developmentally disabled the opportunity to learn, work and play with others. Villa now serves 25 school districts and more than 41 cities in Los Angeles and Ventura counties, and provides individual care to clients with any of 30 disabilities, including autism, Down syndrome and cerebral palsy. The nonprofit also continuously works in training and research to better understand its clientele, which is increasingly being recognized for having dual diagnoses and emotional disturbances. 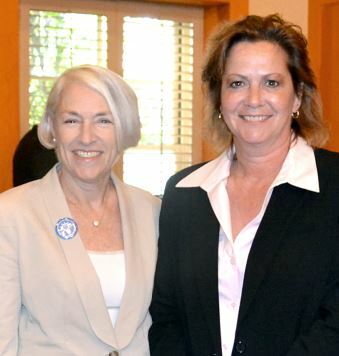 Villa Esperanza Services board chair Patty Zuber has seen first-hand how hard Villa’s staff works to get to know each and every client and their specialized needs. Villa also has fought for a seat at the table with regard to legislation and securing rights for those who cannot do it for themselves. Part of that lifeline is Villa’s ability to grow with its clients and offer a complete continuum of care throughout their entire lives. Integrated adult programs serve aging developmentally disabled adults, as well as vulnerable, at-risk adults and seniors. They help develop and maintain an individual’s functional, cognitive and behavioral skills to successfully integrate into the community, and also help meet clients’ medical needs. The combination helps to maintain an individual’s independence and decrease social isolation. For one mom, Villa has been a part of her son’s and her family’s life for more than 45 years. 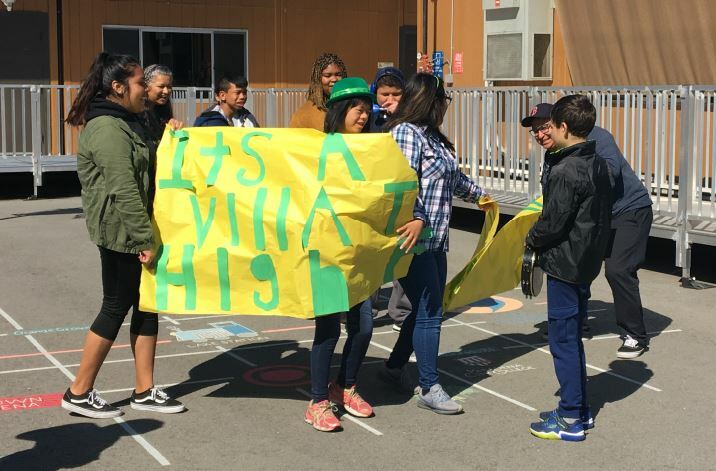 Villa Esperanza School students have fun at a recent pep rally. 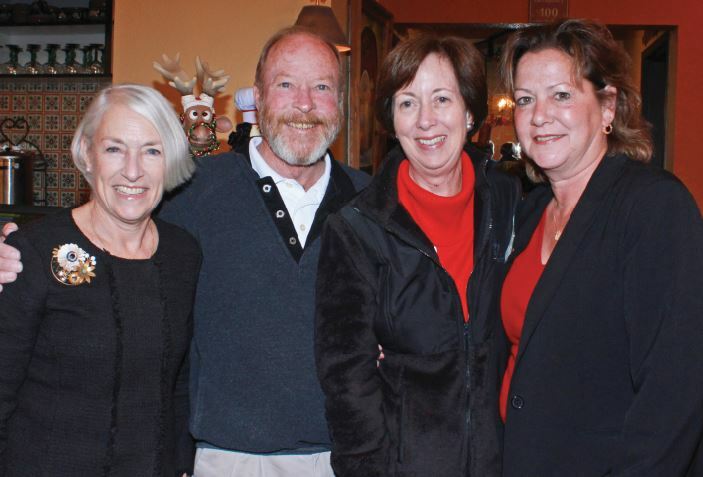 “I’ve asked myself the question many times, ‘What would we have done without Villa?’” said Erika Wilk. Her son, Carson, who has Down syndrome, started at Villa’s Infant Care Center. Initially, Wilk said, she didn’t reach out to Villa because she was skeptical about the institutional model of care that had been widespread in the 1960s. But looking back, Wilk said, it’s clear the early intervention was vital for Carson, who learned to read with Villa’s help at age 3. Carson currently works at Ability First, but has held numerous jobs in the community and also has worked as a professional actor on television. The best way to experience what Villa really does, though, is to visit. Located at East Villa Street, the campus now offers its services at state-of-the-art headquarters. The nonprofit recently finished phase one, with the help of its highly successful “Hope Moves Forward” capital campaign, and includes seven classrooms, two large play areas, a kitchen and a multipurpose room. The result is an open and airy courtyard campus, with multiple play areas designed to engage kinetic learners with modern, colorful equipment and creative, Dr. Seuss-inspired decorations. At a recent spirit day rally, one of the many frequent all-school events, children of all ages (Villa school serves people from 5-22) played and laughed, clapping along with music and cheering each other during group games. David even stood in front of the school and gave a short speech, standing next to a good friend. The road for David might be long, but Villa is committed to every step of it. His dad, a single parent, knows he can count on the nonprofit, especially when he might be ready to return to public schools. Freeman paused to swallow emotion, recalling when David thanked him for getting him clean clothes. “I teared up so much I had to pull over in the car,” he recalled. He knows he can’t make up for the lost years, but Freeman takes comfort in knowing Villa is helping David to recover and thrive.